I read in 'The Gramophone' magazine (1935) that these sound box gramophone needles were synthetic and rather well thought of - comparable to fibre needles. I can't find any other information about them though. Has anyone heard of them I wonder ? 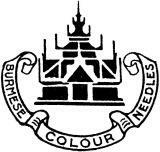 I've noticed that reference too, whilst researching Burmese Colour Needles and their competitors, but have never seen or heard of any surviving. Isn't Voltwood a Harry Potter character?